I'm sure by now you all think my casting of old Yeller has fallen by the wayside... It hasn't. Proxy race prep and just plain building has occupied much of my time, but I haven't forgotten this American Special. Frankly I have been struggling with it... especially the front fenders. I tried carving them in wood... it didn't work out well. I couldn't get one side to more or less match the other. I couldn't use the trick I did with the Allard... doing one and making the second from it. Both sides are mirror image of the other (more or less). Eventually I tried epoxy putty which with a little fiddling I was able to make work. A funny thing about the fenders... in the action photos I have they are fastened in the front and rear but appear to separate from the body at speed... weird. 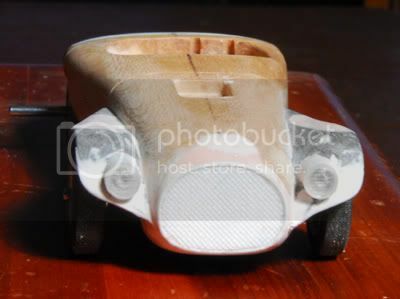 Ahead, I need to make a series of louvers behind the front wheels, headers and exhaust for both sides (probably in soldered brass to stand up to the mold making process), tail lights, a steering wheel (probably stolen from somewhere and a roll bar. Seems the 'Junkyard Dog' has been overseas this year and will be so the rest of the year. I can't find any schedule of it coming to the US. Good News!! The fenders on the real car probably aren't the same either!!!! Great to see. I figured this project was scrapped because the original progress pictures were no longer available. Looks real good so far. Nice! That looks great so far. Indeed it is... and the nose is in a different configuration... AGAIN!!! @#@&^%+!!! I always worry about restored cars and IF they have been restored correctly or is parts from different versions are combined! 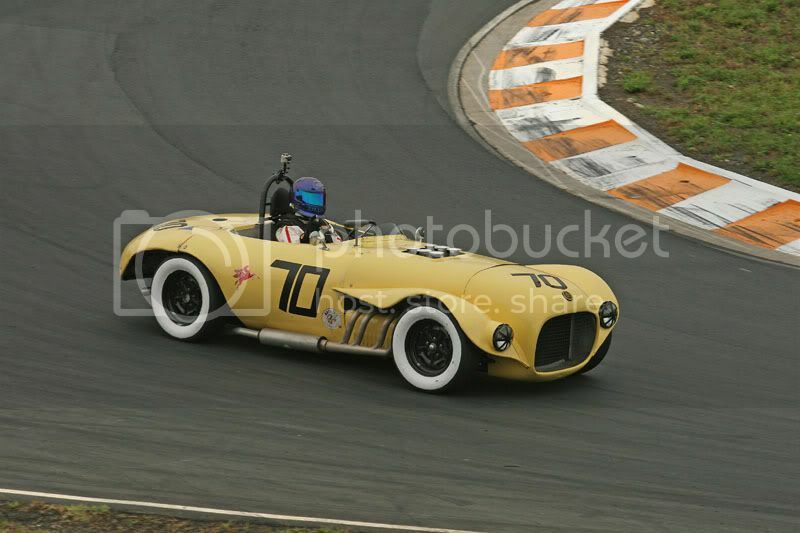 That photo was taken in January at Hampton Downs NZ, so perhaps its still "downunder". You don't have to worry about that with this car. It has never been restored. When shown at car shows it still has the original whitewalls, major cracks and all and the steel wheels have their original rust. Friends of mine own it and the only changes have occurred after wrecks etc. Keep in mind though that the car was always a work in progress. It was hand built from a parts box and the body was hand formed. The pictures do not do justice to`how bad the paint looks. It is cracked and faded in many places, repairs show. It has all the original "Patina" that is valued by some collectors these days. It was here in Ventura for some engine work not too long ago. Ken's works on it for them and keep the old beast running. Max Balchowski would be suprised to see the thing still around I'm sure. Has anything been heard of this project, or is it just disappearing into the twilight? Lat year at Goodwood Revival I talked with Ernie Namagatsu who owns Old Yeller and told him about slot cars being made of his car. He was very interested so I forwarded this site for him to look at, he was pleased I did so. A nice man to talk to. Last edited by f143; 11-18-2014, 01:19 AM. The new/current issue of Classic Motorsports has a good article on Old Yeller 2. Good read.